If you know me, or have followed my blog, or have seen my Instagram then you will know that I love pizza. Love it. It makes my soul happy, just like a soulmate. I'm quite happy spending a Saturday night with a pizza and a Netflix documentary - give me anything with a psycho killer, or ghost hunts and I can happily spend hours unwinding. 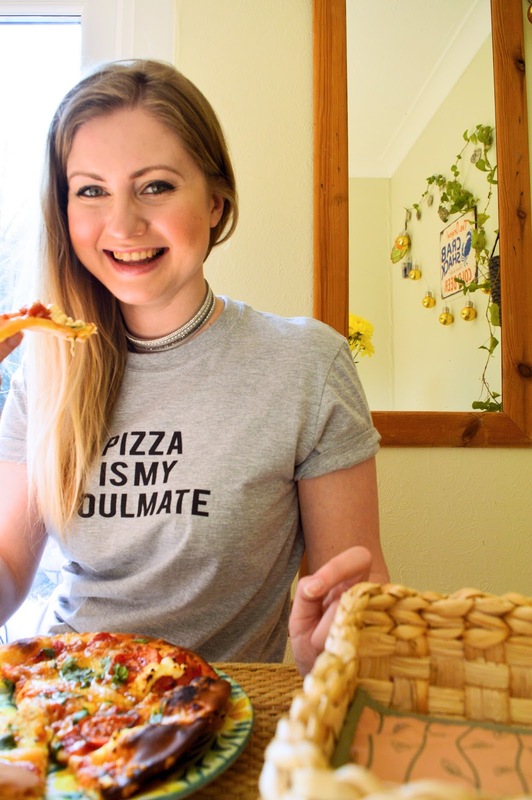 So there was no surprise that when I saw Teesprings 'Pizza Is My Soulmate' I just had to have it in my wardrobe - there is nothing that explains my love for this food more! Slogan tops are a wardrobe staple as they are easy to wear - just choose a slightly oversized style and pair it with jeans for a casual cool look! 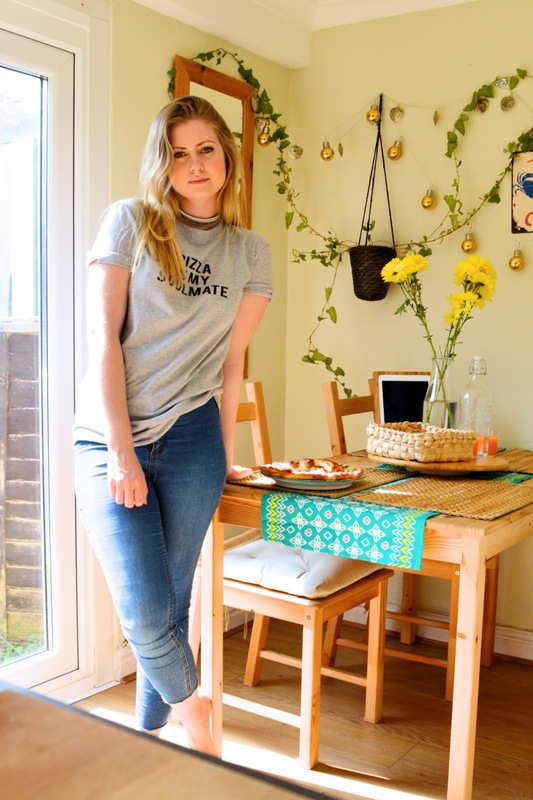 Remember to use the 'half tuck' trick to make your waist look slimmer - just tuck a side of the t-shirt into your jeans and then pull it out slightly so it creates an uneven edge! I also tend to roll up the sleeves a little for a more casual look. 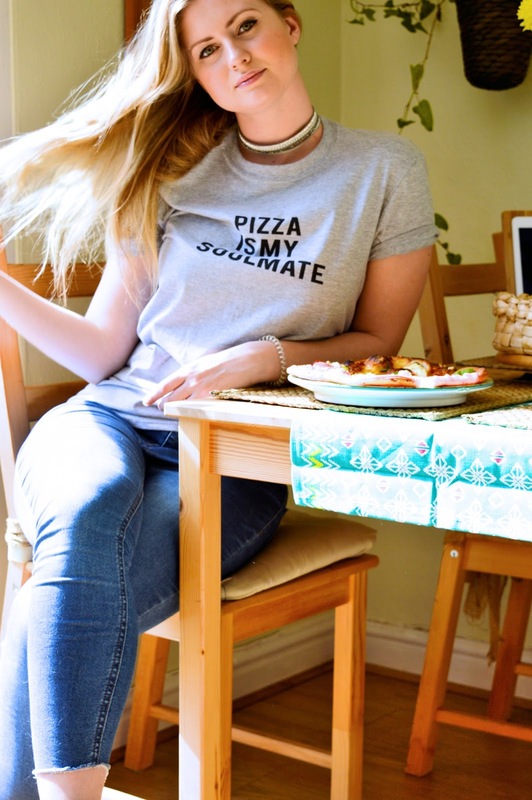 Teespring have a huge selection of slogan and logo tops to suit every person - from food inspired tee's, to feminine empowerment (which I am loving!) you can choose to go colourful or classic writing like the one I am wearing in this blog post. 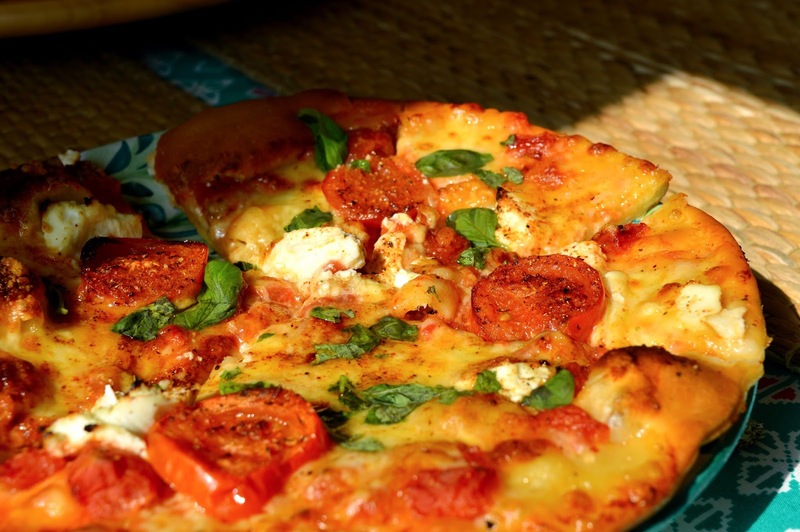 Now lets talk a little pizza, the real star of the show - I make a mean homemade pizza and my favourite homemade topics are the classic combination of fresh tomatoes, mozzarella cheese, a little cheddar and ricotta, and fresh basil sprinkled on top once the pizza is out of the oven. Mmmm.... But when it comes to Dominoes (and I'm a huge fan of Dominoes because you can order directly from their app without any issues, and use PayPal!) I have to go for half and half: one half is always New Yorker, and one can vary from either Hawaiian, CYO (olives, mushrooms, jalapeños, ham, anchovies), or the American Hot. Yes. That is heaven right there. If you're as much of a pizza fan as I am, let me know what your favourite toppings are - I'm always up for trying something new!